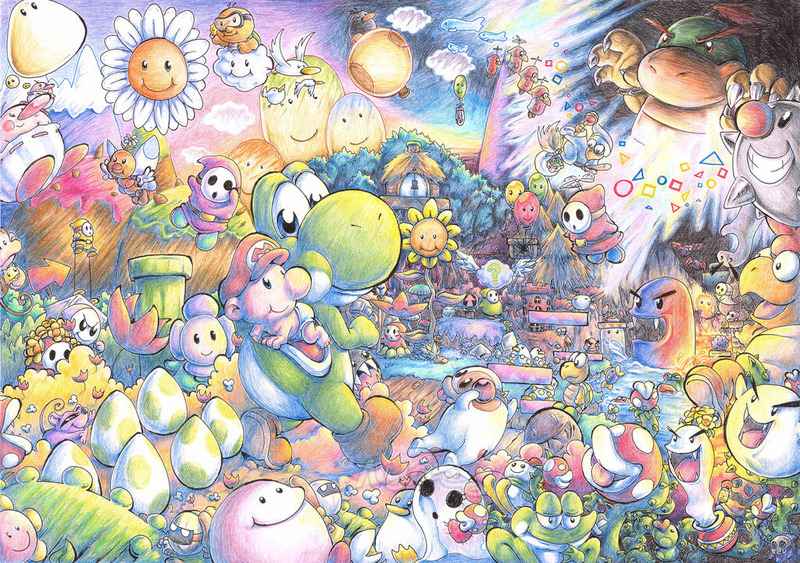 Our Super Nintendo Art Contest Winner is a lovely Tribute to SMW2: Yoshi’s Island! Back in March-May 2018 we had our first Super Nintendo Art Contest on Game-Art-HQ but in the end it was more like a Tribute to the console and its games by all the artists that participated. But especially this one caught the eyes of the jury members due to the big amount of details and the overall cuteness that catched the spirit of Super Mario World 2: Yoshi’s Island completely. It got the most points by all 8 jury members including myself and I believe it is one of the most lovely pieces of art I have seen for any Super Mario or Yoshi game in a good while. An absolutely stunning work by Myaco, aka Katharina from Germany! I recommend to visit her whole gallery on deviantART and especially the progress of this piece that was drawn with traditional tools and later scanned which she documented here. Her original plan was to get even all the characters from the game into the piece but that was more than difficult to achieve with the A2 paper she used. Yoshi’s Island was actually her first own video game, and I guess also one of the first she beat completely. An awesome choice for our contest!